Alongside the G Flex 2 smartphone, LG also announced the LG 105 5K Television at the today’s event in India. The firm claims that this TV is the world’s first one to arrive with a 105 inch 5K display. The screen features CinemaScope 21:9 aspect ratio and boasts of a 5K resolution of 5120×2160 pixels. The TV features an 8 MP camera and other innovative features such as Magic Remote and Smartshare. The 105-inch 5K TV is based on webOS interface, the same platform that its recent smartwatch called LG Watch Urbane LTE came with. The LG 105UC9T 5K TV comes packed with built-in Wi-Fi support, Miracast, Wireless Display, Wi-Fi Direct, DLNA, HDMI and USB connectivity. The 105 inch TV from LG boasts of the firm’s True 4K Engine Pro pixel resolution upscaler and Direct LED backlight features. The other aspects of the device include Smart sound Mode, Wireless Sound Sync, Surround Sound, 3D Glasses and Regional Language Options. 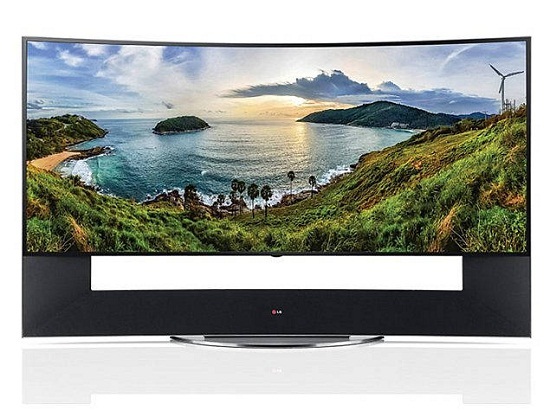 Besides the 105 inch offering, LG also unveiled the LG 77 4K Curved OLED 77EG970T TV that is also claimed to be world’s first. This TV has features including Harmon/Kardon sound, Organic Light Emitting Diode technologies, 4K and many others. Another product unveiled by LG is LG 98 4K ULTRA HD TV that has a 98 inch IPS 4K panel. It comes with an 8 MP camera and it is also preloaded with LG Smart+ TV WebOS. Some of the other announcements made at the LG Tech Show are LG 77 4K OLED TV and LG Music Flow speakers. The LG 105 5K TV is priced at Rs 59,99,900 and it will be going on sale in the coming days. The pricing and availability details of the other devices are yet to be announced.